How many hours does your remote team spend on tasks? Are they taking too long to complete projects? Are they distracted by social media? Non-work related Internet surfing results in up to a 40% loss in productivity for American businesses. As a result 63% of companies monitor employee internet usage through various time tracking software. This data is gathered and analyzed to find out which activities are harming productivity. 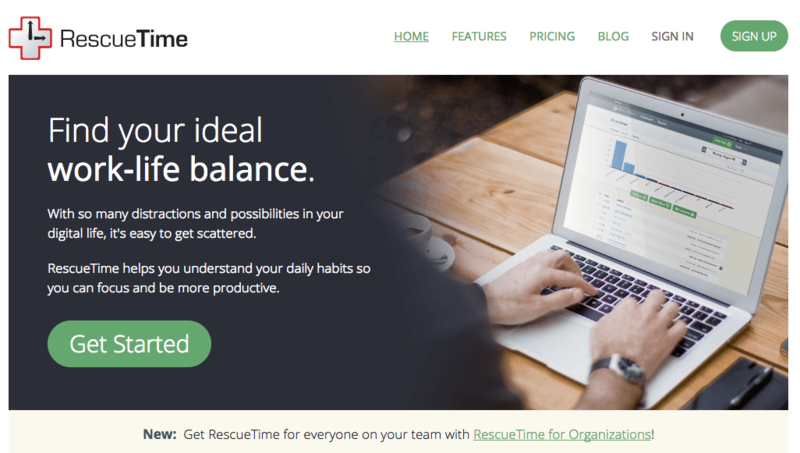 While there are various time tracking tools in the market, in this post I’ll review RescueTime. RescueTime is a monitoring tool which keeps track of websites and applications your employees use during work. RescueTime runs in the background, collecting valuable Internet usage data while your employees are working online. It provides a dashboard where all your data is sorted into useful charts to help you manage your as well as your team’s time. It reports how much your employees are spending on productive websites such as Google Docs, Wikipedia, company websites, etc. RescueTime also shows how much time your employees spend on distracting sites such as Facebook, Youtube, Twitter etc. Unless of course, they work in social media! More about this in a minute. At the end of the week, RescueTime sends you a detailed summary about the activities your employees were engaged in based on their website usage. For example, if your employee spends two hours on Wikipedia, the software categorizes the time spent as ‘Research’. Just remember that since trust is an important factor governing employer-employee relationships, it is always prudent to let your workers know how and why their computers are being monitored. 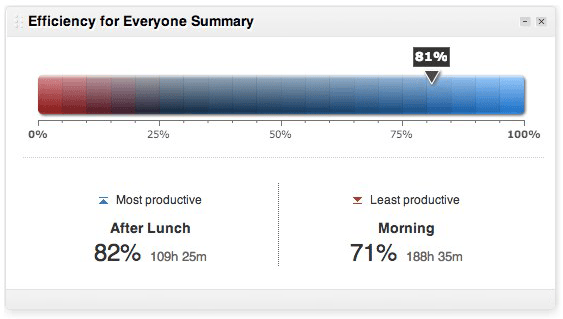 Let’s understand a few features of RescueTime in detail. Let’s also examine how easy or difficult it is to use these features. Most time tracking softwares just list the websites that employees use at work. You don’t know whether these websites help or damage employee productivity. How does RescueTime help in this situation? 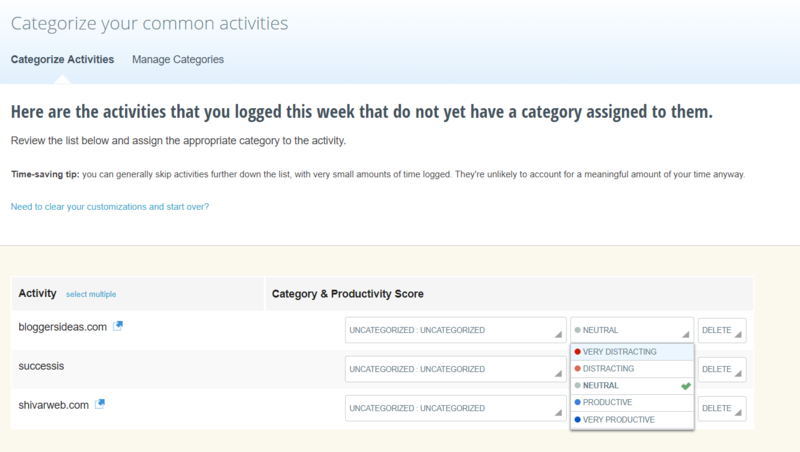 After setting up a RescueTime account, the software asks you what preset activities you find productive. For example, Research, Business, Design & Composition. It also asks about activities that you find distracting, such as Entertainment, Social Media, Shopping. RescueTime system accurately groups websites based on activities. Time spent on company websites is logged under the ‘Business’ category. Time spent on Youtube is logged under ‘Entertainment’, unless you manually classify YouTube as a work related activity in settings. You can manually link certain websites to activities from the Application and Websites Menu. 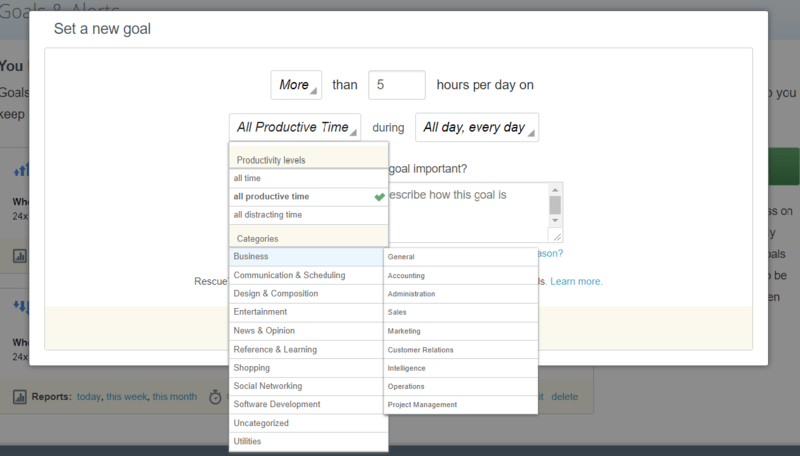 You can also choose what activities you find productive or distracting from the Categories page. For instance, the tool may by default set email as a distracting activity. However, if answering emails is a core part of your team member’s job, you might want to change that classification. The tool gives you total control over the productivity level of every single thing that RescueTime tracks. 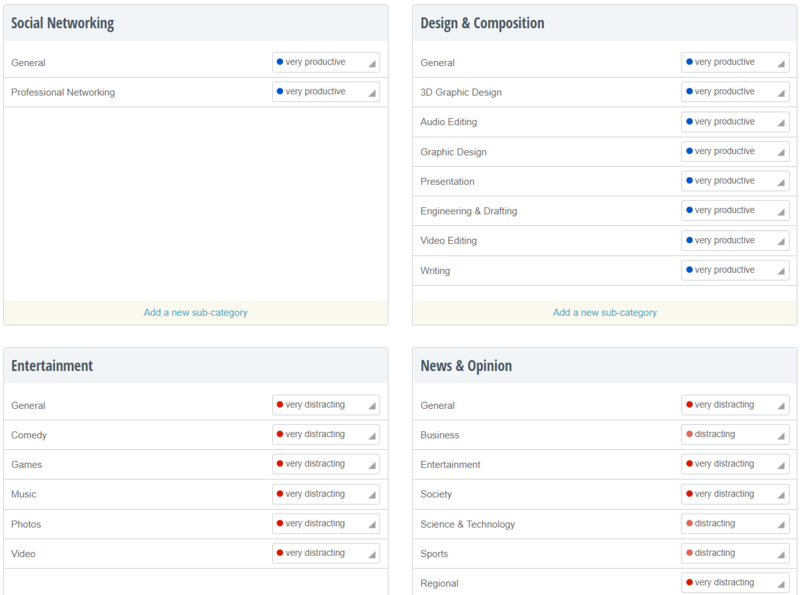 Based on this categorization, the RescueTime summary dashboard showcases how much time your employees spent on useful activities/websites and how much time they spent on distracting websites. It even displays your employee’s productivity score based on these stats. The tool classifies all the apps and websites that have been visited on a five-point scale from ‘very distracting’ to ‘very productive,’ with ‘neutral’ in the middle. This scale is color-coded. While ‘very distracting’ behavior is color-coded red and ‘very productive’ behavior is blue. The productivity pulse can be used for gamification purposes. Based on this score, you can reward your most productive employee of the month. This can help increase competition within your company. Gamification has improved productivity for 90% of workers in most companies. Monitoring applications only check how much time your employees are spending on work sites. They also ensure that your team is not wasting time on distracting websites. However, spending time on work websites just to be ‘productive’ doesn’t cut it. The productive time may not necessarily lead to any progress. Your employees don’t know what they are working towards. If there is no goal, there is no positive emotion. Your team may feel unmotivated even with time tracking software. So how does RescueTime deal with this problem? RescueTime allows you to set daily goals. You can set goals from the ‘Your Goals’ page. These goals are related to how much time you would like to spend on various preset work activities. RescueTime links these activities to its corresponding website/application. For example, you can choose to set a goal of spending 5 hours a day on writing. The app runs in the background and tracks time spent on Google Docs, Microsoft Word or any other word processor. Track your goal progress by clicking on Reports > Goals or by viewing your Dashboard. You also receive a regular summary report showcasing all the goals you achieved during the week/month. Small companies have a limited number of employees who deal with a large number of tasks within a specified amount of time. Customizable goals help employees focus on the most important activities in order improve company productivity. It’s easy to get distracted when you are online. You might be tempted to spend some time on social media, instead of finishing a report. As a result, you are unable to meet deadlines! Don’t worry about manually blocking websites. 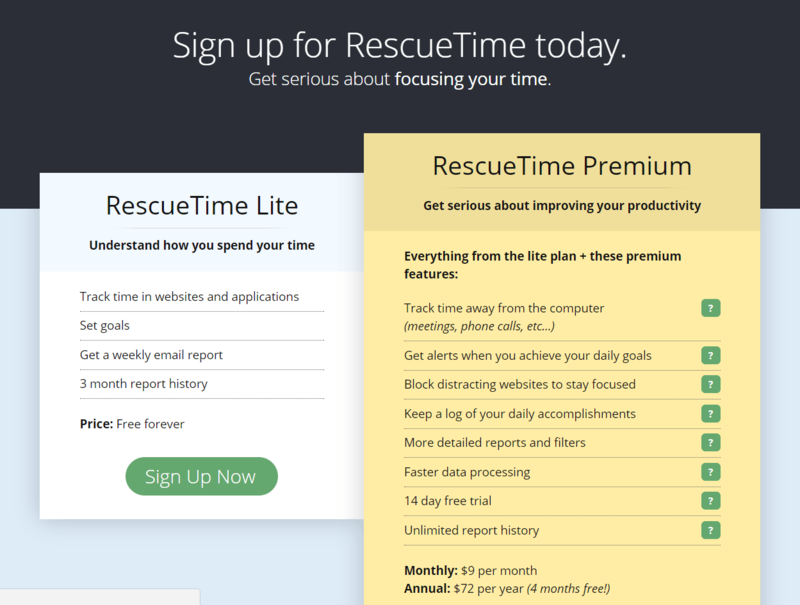 RescueTime premium feature “Get Focused” automatically blocks well known time wasting sites such as Reddit, Facebook, Twitter for a specified time period. You can see this website list on the Get Focused page. Note : It takes a few days for the system to categorize websites as ‘distracting’. In this case, you can manually categorize the ‘Uncategorized’ websites as distracting. Your team members can select the ‘Get Focused’ option when they need to complete a priority task or a complex task. This feature is easy to use and completely blocks them from venturing into distracting websites. When managing a remote team, how do you know whether your employees are working online or offline during the day? More importantly, how do you keep track of what official work your employees are doing offline? RescueTime allows your employees to manually log hours when they would be away from their desk. This feature pops up when your return to the PC after some idle time. Your employees can then account time spent for lunch, phone calls, personal errands and other options. This feature allows employees to correctly report the total amount of time spent on online and offline work to their managers. If you are not using a monitoring software, you have to manually track and analyze each employee’s productivity and goals. Based on this information, you would need to have a discussion with your employees every week. Progress and productivity meetings can be counterproductive as they take up a lot of time. 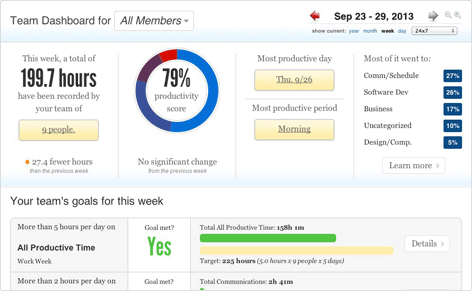 Use RescueTime reports to replace productivity meetings. 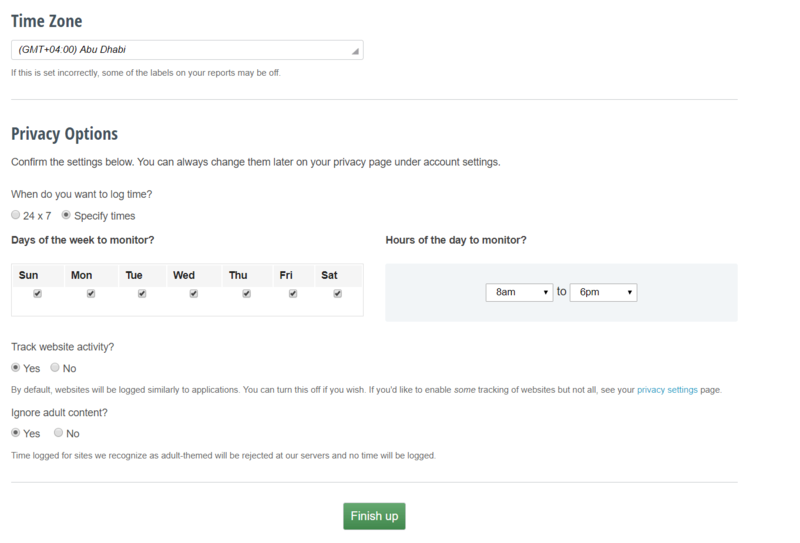 With RescueTime, your employees automatically receive a weekly report on how many hours of worked they have logged in. It also shows a detailed break up of the activities they spend most of their time on. Employees can see what they achieved last week and what goals they are close to achieving. The email also presents additional productivity tidbits to inspire your employee’s productivity for the next week. This report can reduce time spent on productivity meetings and even eliminate the need for them. Employees can learn where they waste most of the times and where they are most efficient. Tracking and managing all your employee’s data can be exhausting and can even reduce your own productivity. Managers need to spend less time on managing their employees and more time on moving company processes forward. The Team dashboard provides detailed information about your team productivity and how they are spending their time during work hours. Is your marketing team spending more time on excel sheets than email? You get insights on where your team members are using time inefficiently, and what work processes are unnecessary. You can find out what hours your employees are the most productive. This can help you find the perfect time to schedule meetings. The dashboard also allows you to create team goals to help motivate your employees and keep them on track. Despite installing a time tracking software on their PC, most employees find another way to procrastinate. They might spend longer time browsing distracting websites or playing games on their phone. Want to track employee phone usage? There’s an app for that. The Android app is free to use and can be integrated with the PC version. The app reports your voice call time, tracks website and app usage. You can also set goals for yourself through the app. By downloading the RescueTime app, employees can avoid procrastinating. The app doesn’t have to run full time, so your employees don’t have to be worried about monitoring their phone usage after work hours. Note: The RescueTime app is only available in Google Play and not the App Store. RescueTime is an easy to install time management software. It takes only 60 seconds to get started. Once you set it up the tool will give you an accurate picture of your time and helps your team stay focused and productive, with minimal effort within minutes. The installable portion of RescueTime is small and lightweight and is easy to uninstall should you choose to do so. 1. 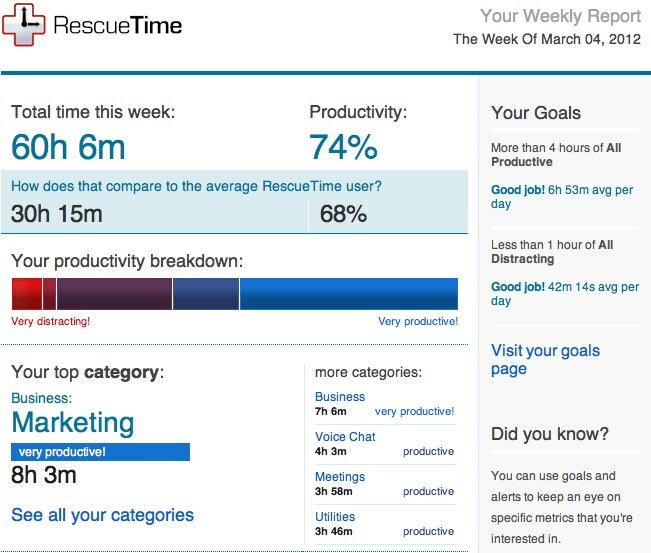 Go to the RescueTime website and create a new account by clicking on ‘Sign Up’. 2. You can choose between the free or premium version. You can also select the free version first and upgrade it to premium later. 3. Download the app and run it on your system. 4. 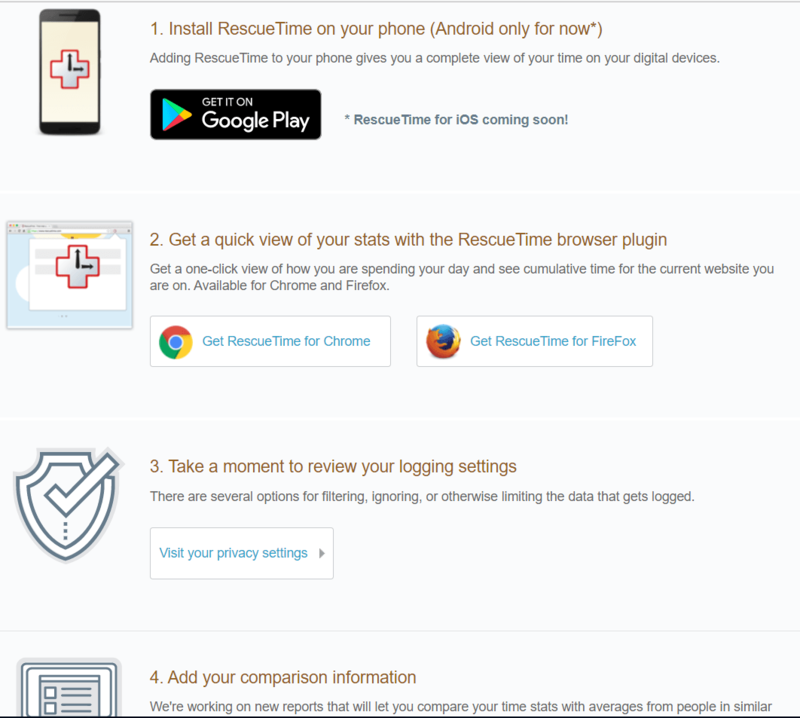 You can activate and sync the app with the RescueTime website through your email address. 5. You can choose which 3 activities are productive and distracting for your organization from the option list. Note : The activity list has limited options which are the same for productive activities and distracting activities. 6. You can specify at what times you want the software to track your activities to prevent collecting employee internet usage after work hours. 7. After setting up the software, the website prompts you download the Android App along with the browser plugin. These additional trackers can be useful for a comprehensive coverage. Is RescueTime Less Intrusive on Employee Privacy? Most employees are unhappy with time tracking and monitoring tools that secretly collect information from their browser. They are afraid that access to browser data can be a risk to their security. Not to mention, these tools gather website usage information without their consent! Acknowledging this fact, RescueTime has designed their system to be less intrusive and secure for employees. 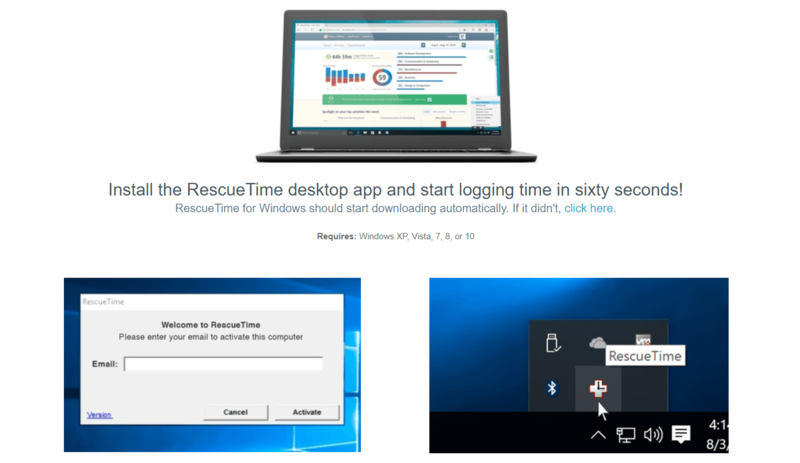 RescueTime is not hidden on the employee’s computer and allows for restricted installs. 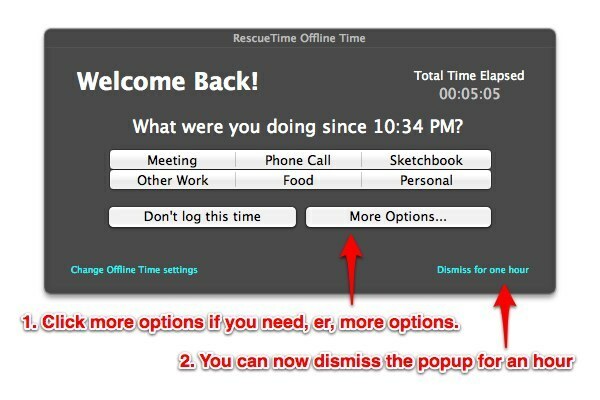 You can choose to limit what RescueTime collects by turning off window title collection, and turning off full URL collection. For example, you can choose whether the software collects www.website.com/moredata or www.website.com. The collected data is safely stored in the company’s database. The software refuses to spy on sensitive user information such as emails, password, bank account information. RescueTime doesn’t take screenshots of employees screen. It also doesn’t monitor keystrokes to detect user activity. 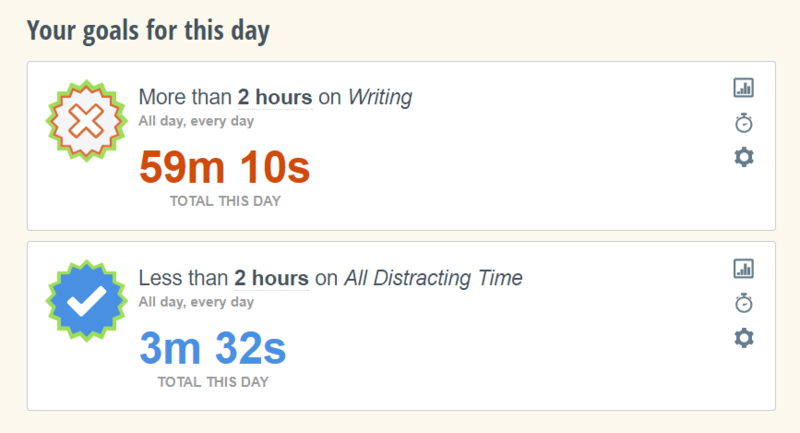 Instead, RescueTime idle time detection activates to prevent inactivity. Note: Idle Detection can cause minor inaccuracy while recording time. Employees can choose what times and days the software can run on their system. They also have control over data recording for 15 minutes, an hour or even a day. RescueTime encourages its users to have a discussion with their team members before installing the app. An open discussion can improve employee trust and your team can reap the many benefits of the software. Using RescueTime can not only identify employees who are overworking or underutilized, you can also gauge employees who are unmotivated. You can see how changes in the workplace affect aggregate productivity. For example, What would happen if you instituted a “no email on Fridays” policy? For teams with a high level of trust, using RescueTime “in the open” can allow employees to see how they spend their own time compared to their average peer. Such levels of workplace transparency can have positive effects on employee engagement. You can get these features and a few more supplementary ones by purchasing the premium version of the software. RescueTime premium has 14 day free trial period. After that, the software costs $9 per user per month. You also have an option to purchase the premium version for $72 per user per year ($6 a month). If you work with a small remote team, you can purchase RescueTime as the same cost of $9 per user month or $72 annually. The only difference is that your team is entitled to a free 31 day onboarding period when upgrading. RescueTime is less intrusive than most time tracking softwares, but is it still good for employees who want control over their productivity tool? The software silently runs in the background tracking all online user activity. It’s true that users can pause for a short period of time. However, the user does not have complete control over the app. The downside to this is that the user cannot specify what activities he/she wants to monitor in order to improve productivity. RescueTime stats only categorize what applications are productive and what are distracting. However, it does not specify what work you are doing with a particular application. For example, you can see that your employee has spent 3 hours on Microsoft Word for ‘Writing’, but you don’t know about what article he/she is writing or what project is currently being working on. On the other hand, there are other tools like Time Doctor and Staff.com that allow you to keep track of how much time your employees are spending on a particular task. Time Doctor’s interactive system allow your employees to be proactive when it comes to tracking their time. They can manually start, pause and stop whatever task they want to monitor. This unique feature allows you to keep track of how much time you are spending on a particular task, rather than only monitoring how much time you are spending on certain applications. Learning what specific tasks your employees finish quickly or slowly helps you improve your task scheduling. You can assign your employees the most time consuming task at the beginning of the day and supply them with smaller tasks towards the end. User dependent time monitoring software come in handy for monitoring project activities. RescueTime has very limited project tracking capabilities. Without this feature, you are unable to track how much time you have spent working for your clients on a particular project. Time Doctor or Staff.com’s project tracking capabilities allows you to generate timesheets for payroll based on the data collected. You can directly bill your clients for the correct amount of time. How do you know if your remote employee is actually on the job and not slacking? When a time tracker is working the background, your employee may leave an application running in order to increase their logged hours. Time Doctor or Staff.com’s screenshot feature allows managers to view their employees screens every 10-15 minutes to ensure they are working. It is actually less intrusive than it seems. The screen capture software only works during work hours and shuts off during breaks. Besides, Time Doctor is completely transparent about informing employees that their activity is being monitored. You don’t need to view desktop screenshots constantly. Employees tend to work with fewer distractions once they know they are being monitored. Tracking your employees every move such as viewing their screens, and having detailed stats about what applications or websites they are using, might seem good for productivity. However, this can also reduce employee trust and increase workplace stress. Many employees would be turned off by this excessive monitoring. It’s as if what sites they are visiting, is more important than the work they are delivering! On the other hand, Time Doctor, focuses on projects and tasks rather than on what websites people are visiting. Even though it can track your web usage, that’s not the primary focus. Most people are far more comfortable if you track the time they are spending on tasks. Currently, RescueTime app is exclusive to Android. However, 45% of Americans use devices that support iOS. Which means that you would be unable to monitor phone usage of most of your employees. Other time tracking tools have iPhone and iPad app allows you to track employee tasks and their application usage, even when they are unavailable at the desk. Different options are available out there. 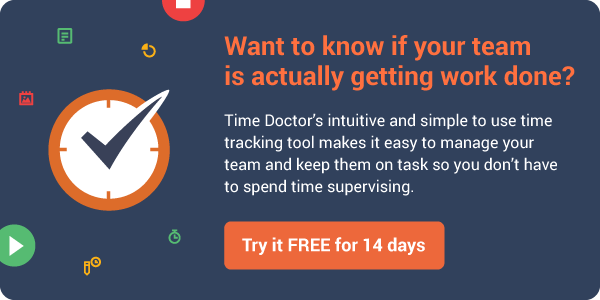 But if you wish to use a tool that can help you track employee productivity without losing their trust, sign up for a free trial of Time Doctor. The fundamental problem with RescueTime, is that it’s all about which activities are unproductive and which ones are not. But does it really matter to you which websites your employees are visiting – even during the workday? Or is it more important to ensure that they deliver their tasks on time? I am guessing it’s the latter. As long as they meet their deadlines and deliver quality work, it might not matter to you if your employees spend a bit of time watching cat videos on YouTube. Moreover, all the data and charts that RescueTime gives you, won’t answer this question – exactly how much time are your employees spending on each task and project? If you want the answer to that question, sign up for a free trial of Time Doctor.